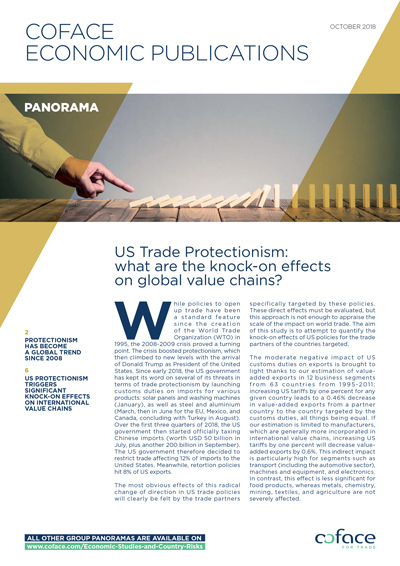 While policies to open up trade have been a standard feature since the creation of the World Trade Organization (WTO) in 1995, the 2008-2009 crisis proved a turning point. The crisis boosted protectionism, which then climbed to new levels with the arrival of Donald Trump as President of the United States. Since early 2018, the US government has kept its word on several of its threats in terms of trade protectionism by launching customs duties on imports for various products: solar panels and washing machines (January), as well as steel and aluminium (March, then in June for the EU, Mexico, and Canada, concluding with Turkey in August). Over the ﬁ rst three quarters of 2018, the US government then started officially taxing Chinese imports (worth USD 50 billion in July, plus another 200 billion in September). The US government therefore decided to restrict trade aff ecting 12% of imports to the United States. Meanwhile, retortion policies hit 8% of US exports.